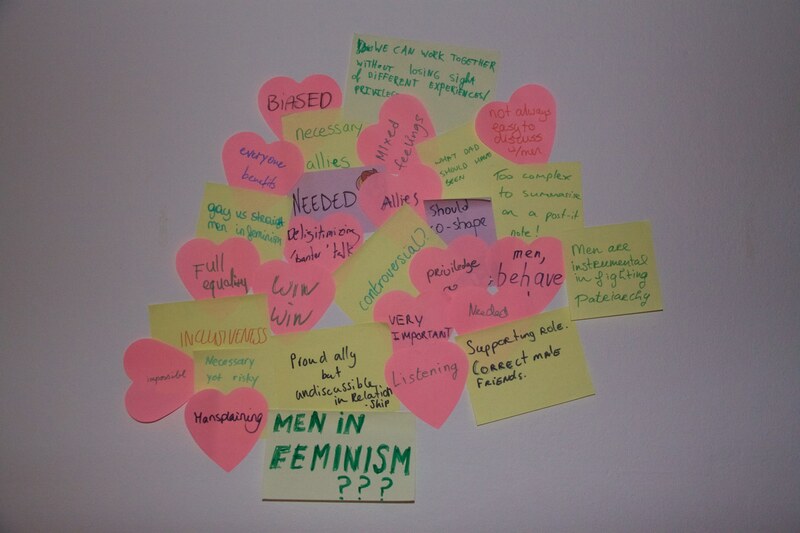 Feminism and Men: Contradiction or collaboration? Real dialogue isn’t about talking to people who believe the same things as you. When I first joined The Feminist Club I decided to do so because I felt this was a space where people were open for real dialogue, as in the words of the late sociologist Zygmunt Bauman (who passed away on the day of our meeting, hence the homage). This is because I truly believe that, even if complex and sometimes defeating, inclusive dialogue is always more constructive than just retreating away in our safe spaces and rejecting people or opinions for their perceived wrongness or incapability of understanding ours. As much as I concede that we all are bound to our particular bio-socio-historical positions and eventual privileges, so that for instance a white middle class man will never have the lived experience a low class black woman does, I cannot accept that this is enough reason to dismiss the first one on the basis of arguments like “he will never understand the position of the second”. Although indeed it will never be the same thing hearing about an experience and actually experiencing it, I sill believe that communication and empathy are a better answer. It is also important to boldly underline, like one of our members so righteously did, that this must be a shared responsibility and not a cumulative burden on the ones who are already in a position of disadvantage. This is also why I was really happy to see the club’s goal to increase diversity of participation starting to be fulfilled, when 3 of the male members agreed to organize a discussion night on the controversial theme of Feminism and Men. I would like to thank Just, Thomas and Gijs once again for their initiative and enthusiasm. The effort they put into it was echoed by the overwhelming interest in attending the event, by far the busiest until now. Not forgetting that previous discussion nights were also as important and productive, and that part of the buzz is due to this theme currently being a hot issue, I think it’s fair to say that it is also a positive sign of the need and will for collaboration. And maybe such collaboration will carry with it some contradictions. But last night we got to discuss them face-to-face, we stepped out of our routinely Facebook post commenting and thought together about ways to diminish them. Lived experience versus empathy / solidarity: Do all feminists need to have the lived experience of being a woman, or can someone be a feminist out of empathy and solidarity? Undoing patriarchy from a position of privilege: What can / should men do to fight sexism, for instance in male-only spaces, but also in society in general? How are women’s voices affected by men in feminist spaces? How can we move beyond the ‘us’ versus ‘them’ dichotomy, beyond the idea of all men as ‘the other’, as natural opponents of feminism? What factors prevent men from being feminists? With these in mind, plus the sources previously shared on the Facebook event page, we organized in smaller groups and started the discussion. After about 40 minutes, the most important issues discussed in each group were shared with everyone and we had a break to relax, pick a drink, and get to know each other better. Then we sat once again and continued discussing for about another half an hour. This is a method we have been following in every discussion night, which proves quite productive and a good way to organize the debate when the attendance is high. This also seems to be positive in the sense that it creates space for deeper personal engagement, like in the case of my group where we started by briefly introducing ourselves and explaining our standpoint on the theme. We began by discussing the importance of the label “feminist” in itself, after one of the male elements in our group explained he felt it was important for him to identify as such, when trying to take a stance among peers. Some of us were worried that with this kind of “statement use” it might become an empty signifier, questioning if it wouldn’t be more productive to rather act in ways that lead to gender equality, and educate others through daily action, instead of calling yourself a feminist per se. Still, we realized that the label has the power of making a practical stance and positioning one in a tradition, thus becoming helpful in certain situations. What is important then, we agreed, is to not take the label for granted and to explain what you stand for, also by acknowledging that there is multiplicity in the feminist movement. One of the male participants noted that a frequent stereotype enacted by men is that of the feminist male hater, and that this is an example of the misunderstandings that can be clarified by engaging in such a dialogue and by drawing attention to that multiplicity. We then were curious to hear about each other’s experiences and particularly share tricks or strategies on how to approach this subject with men. These echoed some of the post-it notes written earlier, like: “not always easy to discuss with men” or “proud ally but un-discussable in relationship”. We concluded that while it can sometimes be even harder for men to discuss it with their peers, since they frequently are subjected to intra-group pressure and get immediately excluded through jokes and provocation, on the other hand, that discomfort and rupture can be productive in the sense that these are themselves signs of the issues at stake. One strategy that seems to work is to not go into defensive mode when confronted with the negative stereotypes but rather to try to push further into dialogue. As one person said: “You don’t want your friends to be cautious when you’re around because you are the feminist, you want them to understand it too”. Later, when we shared the important points discussed in each group, someone else mentioned on this topic, that a strategy adopted by her as a woman engaging with male friends was to share with them, as much as possible, situations where she felt she was being a victim of sexism. Another topic that came into discussion was the importance of constantly putting gender roles and stereotypes into question so that the dichotomy of men vs. women, us vs. them, start to be perceived for what they are, simply constructions and not natural categories in opposition. As long as we keep seeing it primarily as a tournament, of men against women and women against men, we will not reach beyond the accusation, self-defence, and condescending speech. This does not mean being naïf to, or not acknowledging the power dynamics structuring the relationship between men and women. But as men are also, in a way, “born into” or socialized into these power structures, if we take men as the power structures themselves we are doing nothing but naturalizing such power as well, instead of de-constructing it. What we need to do is to recognize genders as constructed, and the real existing multiplicity in genders, instead of perpetuating stereotyped men and women. And then we will be ready to join forces against common enemies, instead of fighting each other. It would be difficult to list every nuance of this evening discussion but there is one last point I would like to mention and that is also echoed in my favourite post-it, which reads: “what dad should have been”. One of the groups reported discussing good educational practices and how to raise awareness about gender equality in children. We all agreed that this is a very important issue, and took the opportunity to also spread the word about a project by Emancipator, which is looking for male collaborators to go to schools and have talks with boys on this subject. Hopefully this will empower them and make up for the role model they might also be missing. The most important conclusion of the evening was the fact that we need to not simply wear the feminist label, be it men or women, but to practice it, communicate it, start dialogues. Especially in a time when this is a celebrated topic in media as well as in institutional contexts (as the UN “He for She” programme or the Dutch project Emancipator are examples of), it is crucial that we keep an engaged and critical position so that this can become a true collaboration and not slide into forms of reaffirming privilege or condescending actions. This can be achieved by practicing quotidian “micro-revolutions” that taken together will start to have a real impact. By the end of the evening I felt, as I hope everyone else who joined us did, that we get more empowered to do this together, than apart. We would like to thank Atria, institute on gender equality and women’s history, very much for hosting our event. We highly recommend any feminist person in the Amsterdam area to pay Atria a visit.